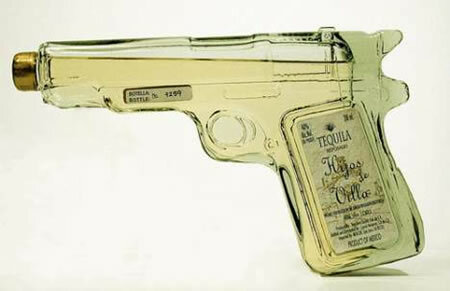 Hijos de Villa Tequila Gun: You Call That A Shot? You feelin’ lucky today, punk? Well, shazzzam! If you need a new accessory for your Whiskey Holster, you might be very lucky indeed. The Hijos de Villa Tequila Gun chooses to opt out the violence of bullets, and replace every “shot” with 200ml of tequila in all of its drunk-aiding glory. You know what would be awesome? Drinking all of the Tequila (since that’s the only way you’ll ever be drunk enough to do this), replacing it with urine, and threatening to shoot it at your friends. Or random strangers on the street. That works too. People will assume you’re spraying them with tequila (or water, if they don’t see the label), and you’ll be able to snicker slightly to yourself as you’re bathing people in piss. List price is $60, but they are currently out of stock. Terrible advice about bathing people in piss. I would never piss on anyone but I wouldnt hestitate with you. I have a hijos de villa rifle shaped bottle. Still wrapped in its original package. Selling for 150 or better offer. Call 858-77-8696 if interested. this Tequila bottle is alright but this Vodka bottle is so much cooler and made in Illinois so you know its awesome. These guns are not expensive. I was just in Chicago for my buddies wedding and they had these guns for $20. I bought 6 of them.